Those were the rules back in the 1960s, and so we had to sit and watch lesser teams challenging the European clubs in the Inter Cities Fairs Cup. That was until 1966 when, after support from the Football League's Alan Hardaker, we were finally allowed to join the competition, and forty years ago today we stepped out onto the pitch in West Germany, the very country where we'd gone out of the European Cup six seasons earlier. After all the deliberations we were off to Stuttgart in the south of the country and as we left these shores we did so in some good form. We were second only to Chelsea in the league and after nine league and cup games were unbeaten. 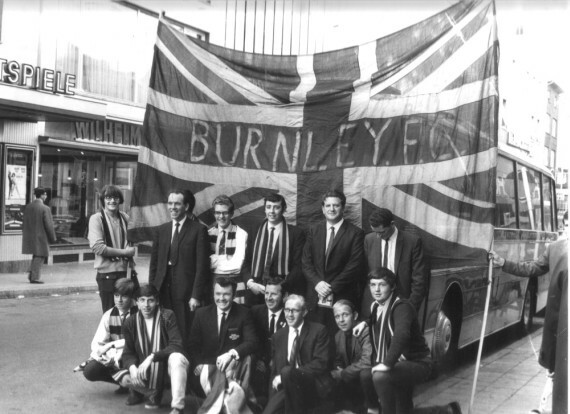 It wasn't just the players who were leaving and this was a big occasion for a group of supporters who made the long journey by coach with local company Central Motors, leaving Burnley on the Sunday and returning four days later. Some of those fans had to save for weeks to raise the £25 for the trip. They made it to Stuttgart, in time to find out that we had four players receiving treatment following a bruising encounter against Spurs on the previous Saturday, a game that had ended 2-2 with both our goals scored by Andy Lochhead. Andy was one of the four injured players, the others were Alex Elder, Willie Morgan and Sammy Todd. One club who were desperately hoping Morgan would play were Chelsea. 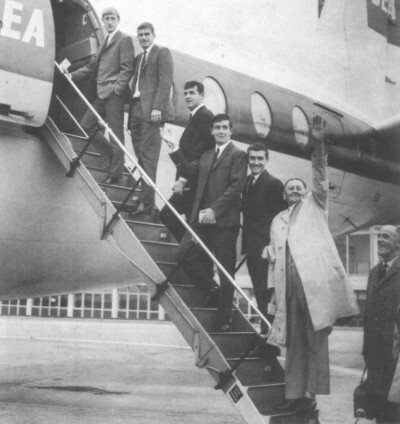 Their manager Tommy Docherty was flying out to take in the game specifically to watch Morgan. Burnley wouldn't comment but there were suggestions that the London club could be preparing a £60,000 bid for our Scottish international winger. Even in September the temperatures were high and so the Clarets chose to train in the evenings as they prepared for this return to Europe. Our opponents Vfb Stuttgart had started the season well and a 2-0 weekend win over TSV Munich had seen them go top of the Bundesliga. They would certainly prove to be tough opposition and it was thought that a draw or even a one goal defeat would be a good result to bring home for the second leg. The signings of Bo Larsson and Gilbert Gress, from Malmo and Strasbourg, in the summer had given them a lift and the two new players were linking up well with the star player Hans Otto Peters, although Peters was ruled out of the tie with injury. Most fans waited at home for news, in the end around 120 Clarets made it to take their place in the 70,000 capacity Neckarstadion which looked deserted with an attendance of not much over 10,000. The locals had snubbed it, preferring instead to watch the league games, and they made the correct choice as a Burnley side, with all the injuries cleared up, proved to be much the better side. 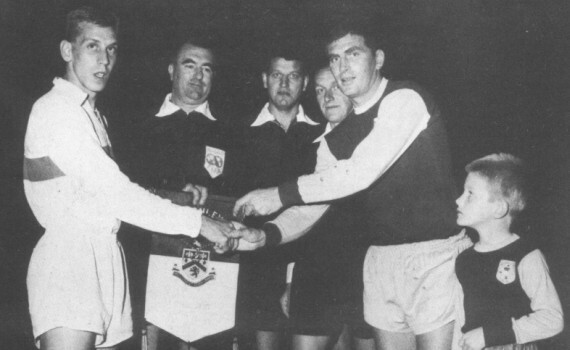 We would have won but for some strange decisions by Swiss referee Gilbert Droz who not only gave the home side a hotly disputed penalty but with just a few minutes left sent off Brian O'Neil, the wing half becoming the first Burnley player to be sent off for over fourteen years. The Burnley party were furious, so much so that it created a bad atmosphere at the after match potato pie supper laid on by their hosts. The Clarets could have taken an early lead when Willie Irvine broke clear in the second minute but he ended a great run with a weak left foot shot that the keeper saved easily and within minutes both Lochhead and Ralph Coates had tested the keeper. It had been a superb start and just past the quarter hour mark we went in front. Morgan and Gordon Harris started the move that led to O'Neil breaking down the left. His brilliant curling cross was just the invitation Irvine needed and the Irish international swept the ball home. We were outplaying the German side now and O'Neil smashed a shot against the bar before Morgan shot wide when we had players better placed. Between those two efforts Stuttgart had their first attack but it was dealt with by Adam Blacklaw. It was still 1-0 at half time, we should probably have had it won, but disaster struck five minutes into the second half courtesy of the Swiss official. Reiner cut into our box, went down as Arthur Bellamy moved in and the referee astonishingly pointed to the spot. “A penalty? It was ridiculous,” Bellamy said after the game. “I can honestly say I never touched Rainer, he just fell down.” When I recently asked Arthur about this game he said his memory was not that good but when I mentioned the penalty he immediately said that it had been a poor decision. Forty years hadn't changed his views on this. Weiss beat Blacklaw from the spot and just a few minutes later we were thankful for a header off the line from Brian Miller to keep us level, but we were soon back on top and facing some rather dubious tactics by the home side. Elder collapsed after a shocking tackle that went unpunished. O'Neil reacted angrily to a challenge by Horst Koppel and had some words with him, only to find that the Stuttgart midfielder spoke perfect English, even understanding the Geordie dialect of our Bedlington Terrier. Burnley continued to push for a winner but with four minutes to go O'Neil got his marching orders and to this day no one knows why. The Stuttgart player involved was Theo Hoffman who, according to Burnley Express Sports Editor Keith McNee, made the most of a nothing situation. McNee said he wriggled like a porpoise and gave a performance which would have done credit to an extra on the receiving end of a bullet in a Western film. Even Hoffman accepted the decision might not be correct saying: “O'Neil did not deserve to be sent off, it is very regrettable.” Even so we had a draw, and despite being without the influential O'Neil who would be suspended for the second leg, we were immediately posted as favourites to go through such was the difference in quality between the two sides in the first leg. That second leg was to be played one week later. Vfb Stuttgart: Sawitzki, Bohringer, Hoffman, Entenmann, Siebold, Huttary, Koppel, Gress, Weiss, Larsson, Reiner. Burnley: Adam Blacklaw, John Angus, Alex Elder, Brian O'Neil, Brian Miller, Arthur Bellamy, Willie Morgan, Andy Lochhead, Willie Irvine, Gordon Harris, Ralph Coates. The last photograph was taken on a visit there in the summer of 2005 on the way to the Clarets' pre-season tour in Austria. I would like to thank my friend and fellow Claret Phil Allanson for arranging the visit and the staff of Vfb Stuttgart at the stadium who made us so welcome.